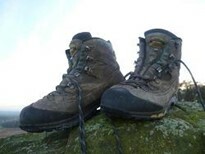 Boots are synonymous with the hills and walking, and with good reason. If your feet are uncomfortable the chances are that could ruin your day, and potentially slowing you down to an extent that safety could be compromised. Here are a few considerations for the type of boot required.